Sit back and let this dish send you away to a region of India known for their spicy, flavorful food. 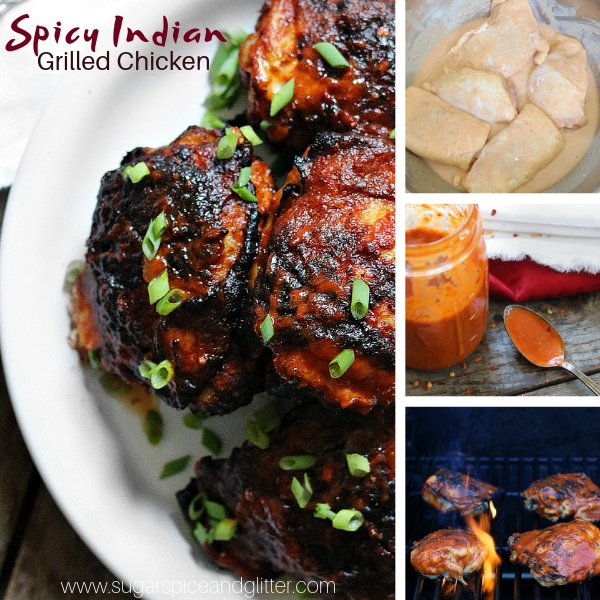 This Khandeshi Spicy Chicken is a simplified take on a classic you are sure to love. When it comes to certain foods I am a firm believer of the spicier the better. I have been a spicy food fan since I was a kid. I remember watching my dad eat hot peppers like candy right out of the jar, so I suppose it’s only natural I like spicy food. My daughter’s godmother is Indian-Canadian and I’ve been lucky enough to learn the basics of Indian cooking from her. However, the country has so many different styles and traditions of cooking, I am constantly finding new recipes and flavors. Recently, I was watching a travel show that featured the region of Khandesh. Khandesh is a region in Central India known for their spicy food – it is actually in the top three regions of India that produce the spiciest food. I had to do some digging into this region and it’s food traditions. 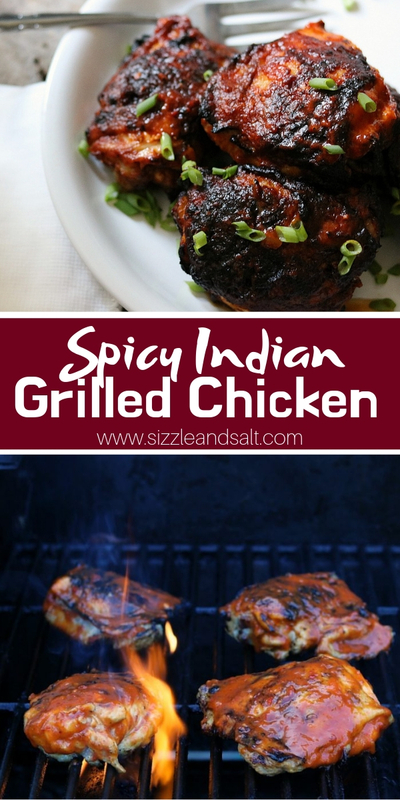 This recipe is actually inspired by a traditional Khandeshi curry soup, but since it’s grilling season here and not soup season, I decided to modify the cooking method and recipe to work as a spicy grilled chicken recipe. 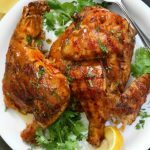 This Khandeshi Grilled Chicken recipe has all of the same flavors as the original inspiration thanks to ingredients like coconut milk, garam masala, and harissa. What is Garam Masala? Garam Masala is a blend of multiple spices; the exact blend can vary quite a bit based on the person or company making it but it usually includes cinnamon, nutmeg, coriander, cumin, black pepper and cardamom (among other spices) and almost never includes turmeric (which is a main ingredient in many curry powders). It is more sweet than spicy. The best thing about using Garam Masala is that you get all those amazing spices in one. You can even experiment with making your own. What is Harissa? 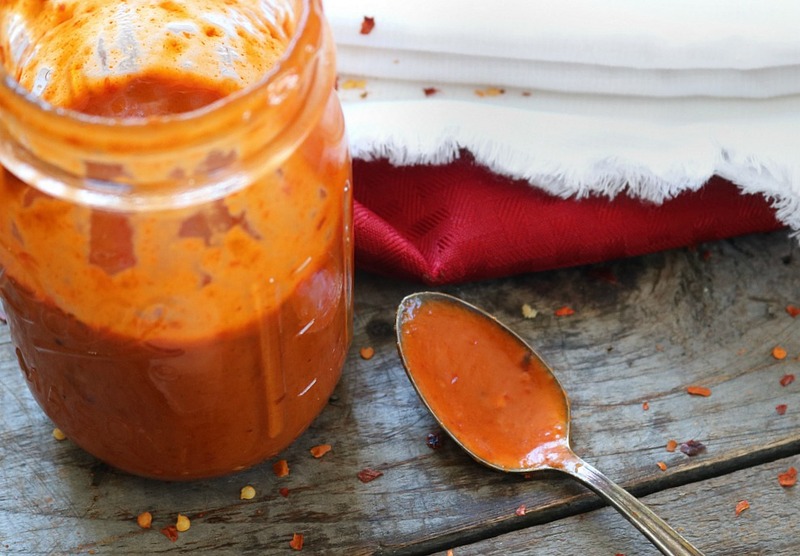 Harissa is a red chile paste that packs a lot of heat. It can also contain garlic, olive oil, and spices, depending on the brand purchased. Both Garam Masala and Harissa paste can be found at most grocery stores, but you can also order them from Amazon: here and here. How to Freeze Grilled Chicken: Let the chicken cool completely in the fridge before placing in airtight, zip-top bags and freezing for up to 3 months. Ideally, you should freeze the uncooked chicken in the marinade as it can last up to 6 months and is less prone to freezer burn (as it contains more moisture than cooked chicken). 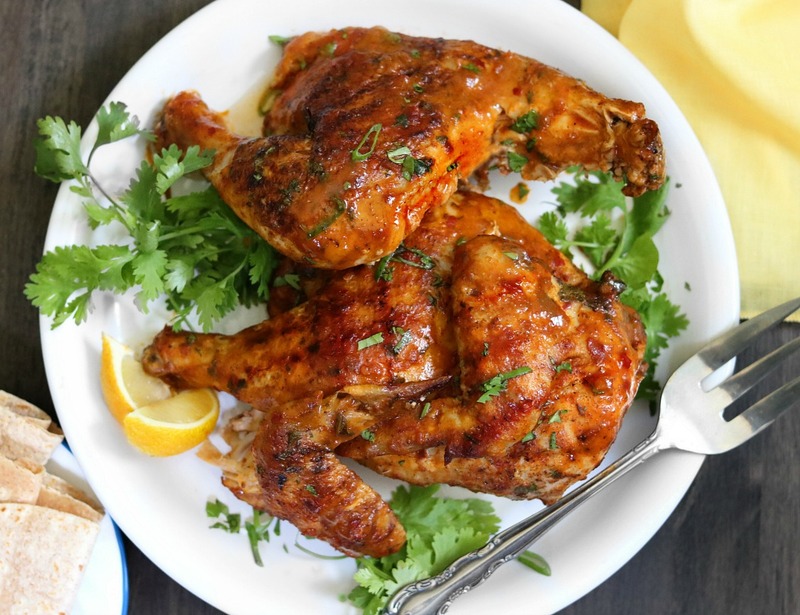 This Khandeshi Chicken recipe has a slight sweetness underlying it’s spiciness. 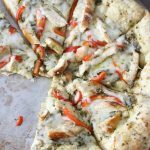 You can adjust the heat by using more or less Harissa, hot sauce, and cayenne pepper than this recipe calls for. 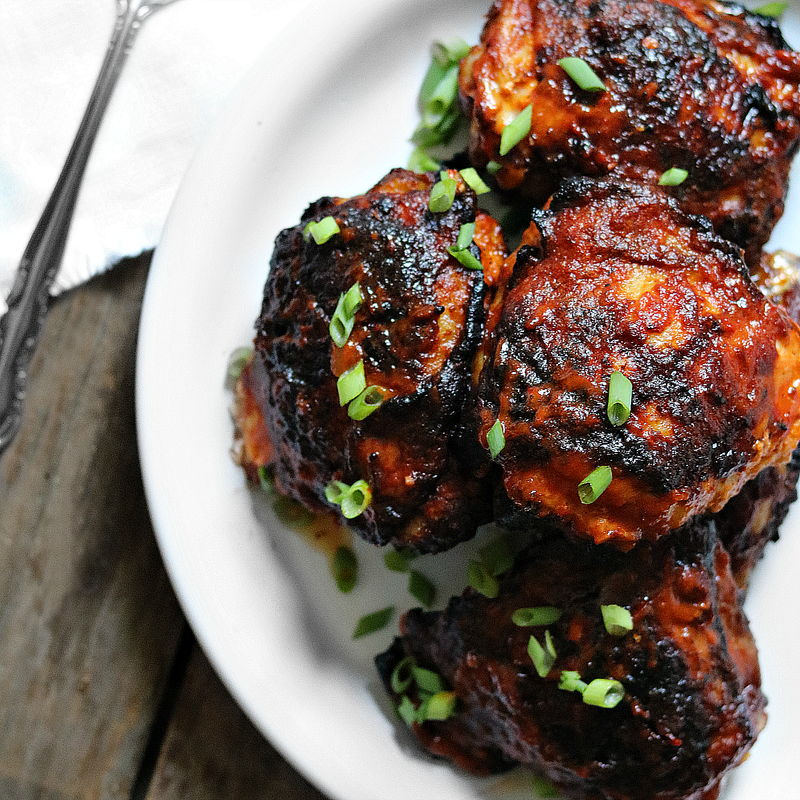 For my low-carb friends, this recipe works out to 3g net carbs per chicken thigh! Grab some ice cold milk and let’s get grilling! 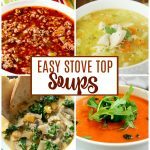 Scroll down to our free printable recipe card for exact measurements and nutritional information. Combine marinade ingredients in a bowl or shallow dish. Coat chicken evenly, leave in dish skin side up. 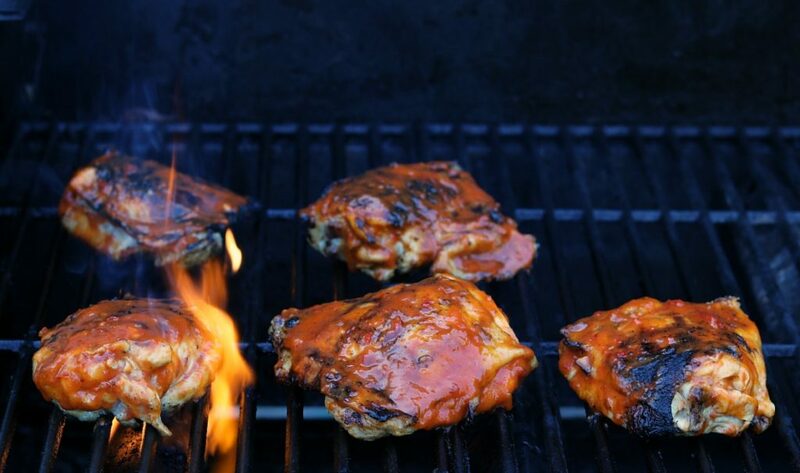 Place chicken thighs skin side down on the grill, do not try to turn for at least 2-3 minutes or skin with stick. 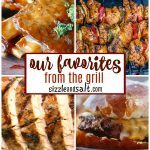 Note: Reduce your grill temperature if necessary (some grills cook hotter or have hot spots, chicken thighs cause flare up). 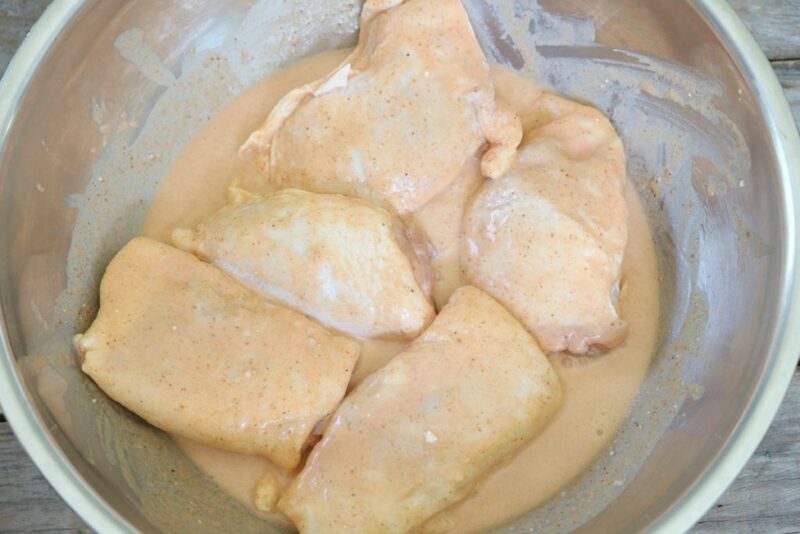 Flip the chicken, turn grill to low and brush with the sauce. The key is to not continuously flip the chicken. Allow to cook at 400º for about 20 minutes. Brushing with more sauce every 5-7 minutes. Cook time will depend on the size of your thighs and grill temperature. Brush with sauce one last time before removing from the grill. To be sure chicken is cooked through use a thermometer and look for 165ºF. Sit back and let this dish send you away to a region of India know for their spicy food. 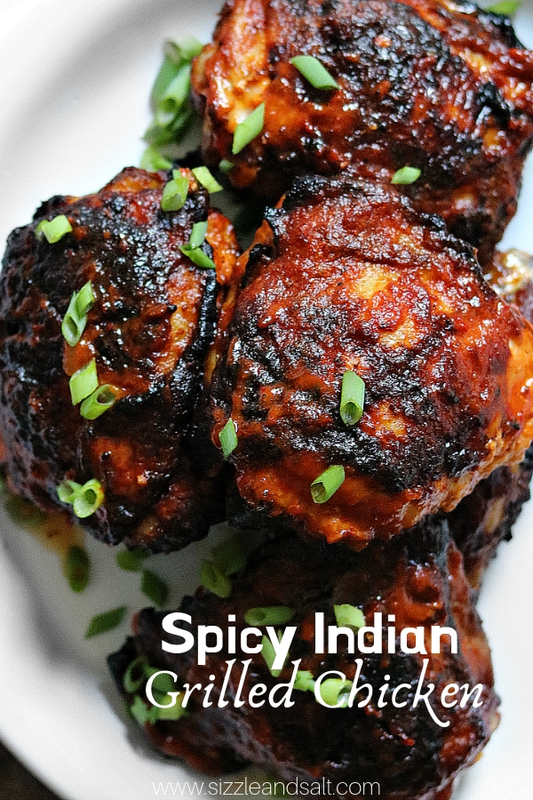 This Khandeshi Spicy Chicken is a take on a classic you are sure to love. 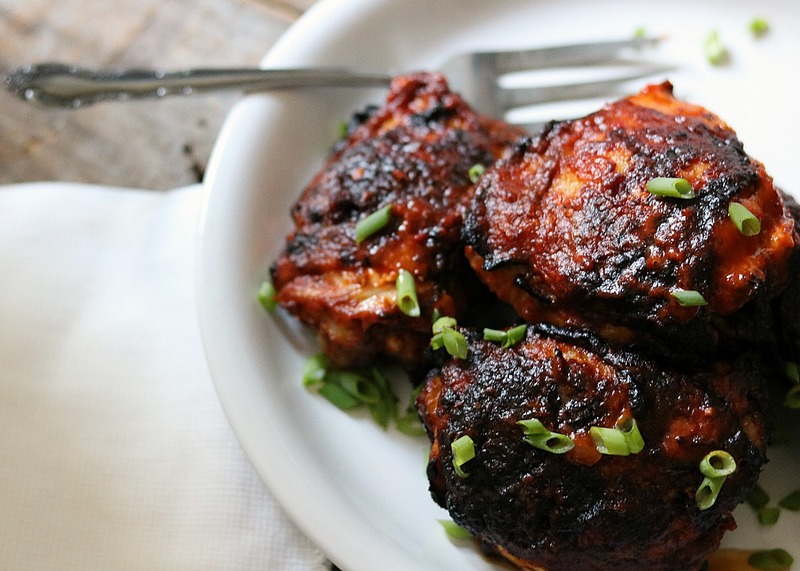 This flavorful and spicy grilled chicken recipe is perfect for grill enthusiasts who like a bit of heat, even in the summer! Not so much into real spicy, but this looks amazing enough to give it a try!